Greek temples provided the inspiration for America's "own" architecture, that is, a style not borrowed from Europe, like the Georgian & Federal styles which were the first styles employed in the new republic. Philosophers & statesmen were searching to separate America from the royal precedents of Europe. Henry Benjamin Latrobe is credited with the first use of classical orders in his design for Philadelphia's Bank of Pennsylvania, 1798. The new republic's identification with classical Greek principles of democracy coincided with sympathy for Greece's contemporaneous struggle for independence from Turkey, fueled by the poetry of Lord Byron; early 19th century archeological discoveries in Greece; and heightened interest in classical literature. Many town & street names were borrowed from Greece; i.e.Ypsilanti, Ionia, Euclid, Troy, & Utica . The style reached the height of popularity 1830-1850, spreading from the East along the major routes of migration to the South and Midwest. Towns filled with white Greek temples or modified representations of the same. 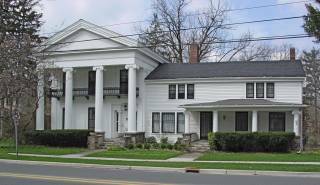 Most Greek Revival style buildings presented low-pitched pedimented gable roofs to the street, supported at the corners by pilasters. The most imposing examples had colonnaded porches with Doric, Ionic or Corinthian columns. Symmetrical openings were typical. While the major public Greek Revival buildings of the East were masonry, most smaller examples were wood. Since it was believed that Greek temples were constructed of white marble[archeological evidence has only recently revealed that they were painted in polychromal schemes], the clapboard was painted white. The purest examples had facades of butted not lapped siding which was plastered then painted with veins to imitate marble. The six over six paned, double hung window munton bars were painted black so that they disappeared, simulating the blank openings of a temple. Shutters, when used, were painted black or black/green. Front entrances often had single paneled doors with engaged columns or pilasters[with or without sidelights] supporting a lintel or transom with horizontal rectangular fanlight above. The Midwest, in particular, produced modifications and some fine, inspired individual examples of the style. [One such is the Clarkston house at 58 N.Main. Note, particularly the Greek key motif of the windows]. A street-facing temple with single story wing to the side was the variation most often used for smaller residences. 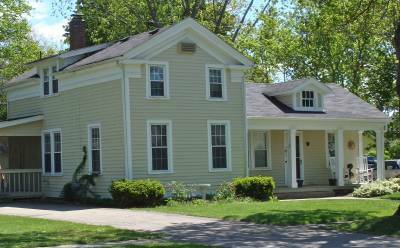 Some examples, like those of 58 N. Main, right, have pilaster porch supports. Most examples have only pilasters at the corners to support the pedimented gable with the colonnaded/pilastered porch recessed along the single story facade, i.e. 28 N. Holcomb, left. As in this later example, there were often two front doors, at right angles to each other. One door was to a "Sunday" parlor, while the other was the family entrance. 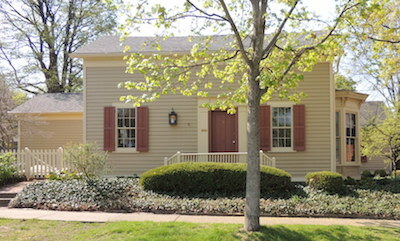 Another variant common in the Clarkston area has the building's pedimented gable end turned at a right angle to the street giving it an earlier Colonial or saltbox appearance. 8 E.Washington, right, is an example.